Intel introduced its Xeon Processor E5-2600 v2 product family (Ivy Bridge-EP) for powering servers, storage and networking infrastructure in data centers. The announcement at this week's Intel Developer Forum (IDF13) in San Francisco highlights a major push by the company to "re-architect the data center" by combining energy-efficient, multicore silicon, the open architecture of software-defined networking (SDN), and network functions virtualisation (NFV). The new Xeon processors leverage Intel’s 22-nanometer process technology to deliver energy efficiency improvements of up to 451 percent when compared to the previous generation. The processor family also features up to 12 cores and delivers up to 50 percent more performance across variety of compute intensive workloads. 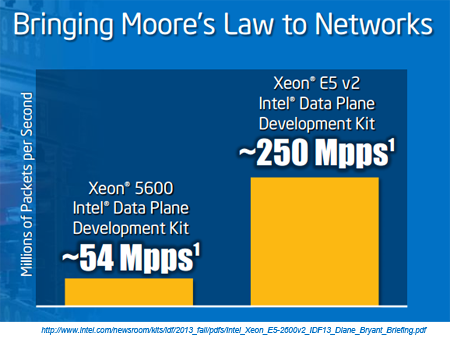 Significantly, Intel is positioning the Xeon E5-2600 v2 product family for processing network workloads commonly handled by proprietary offload engines and accelerators found in networking appliances. The idea is to use Intel’s Open Network Platform (ONP) server reference design, high-volume Xeon-based servers, and open standards to consolidate virtualized networking applications. Intel believes the next generation of data centers will need to evolve to a "software defined infrastructure" where many of the functions are managed in software. The Xeon E5-2600 v2 processors are designed to deliver the throughput performance and latency for Software Defined Networking (SDN) and Network Function Virtualization (NFV) workloads. Intel’s ONP server reference design is based on the Wind River Open Virtualization Profile and the Intel Data Plane Development Kit Accelerated Open vSwitch. 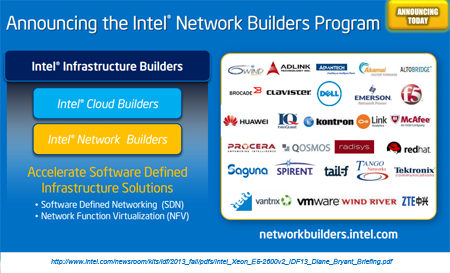 Intel also announced a Network Builders ecosystem to help partners accelerate SDN and NFV deployments. With more than 20 leading technology companies contributing, Intel’s partners will be able to access a comprehensive reference architecture library of proven solutions to build and optimize software-defined infrastructure based on today’s telecommunications, cloud, and enterprise datacenter requirements. The Intel Xeon processor E5-2600 v2 product family is also designed to power cost efficient scale-out, distributed, and software defined storage. 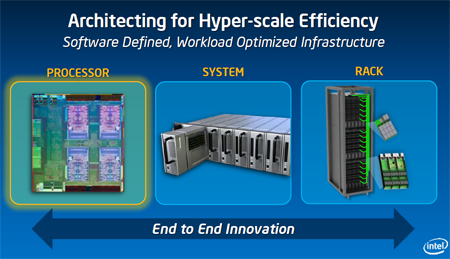 The Intel Xeon processors E5-2600 v2 product family will power the IBM's new NeXtScale System, a high-density, flexible computing platform designed for high-demand workloads such as analytics, technical computing and cloud delivery. Intel's newest processor family also will be used in IBM's new x3650 M4 HD high-density storage server, ideal for managing big data and business-critical workloads, as well as all of IBM's two-socket systems including System x racks and towers, Flex System, iDataPlex, and BladeCenter offerings. HP is an ecosystem partner for Intel's ONP server and switch reference design. Dell has selected the new processors for its upcoming storage solution. System manufacturers from around the world are expected to announce hundreds of Intel Xeon processor E5 family-based platforms. These manufacturers include Acer, Apple, Asus, Bull, Cray Cisco, Dell, Fujitsu, HP, Hitachi, Huawei, IBM, Inspur, Lenovo, NEC, Oracle, Quanta, SGI, Sugon, Supermicro, TYAN, Wiwynn and Unisys. Last week, ntel launched its second generation, 64-bit Intel Atom C2000 product family aimed at lightweight workloads in hyperscale data centers. d Intel CEO Brian Krzanich in a keynote address at this year's Intel Developer Forum 2013. Intel is now shipping a multimode 4G chip, the Intel XMM 7160 modem, which is one of the world's smallest and lowest-power multimode-multiband solutions for global LTE roaming. The current version is data-only with 3G voice. 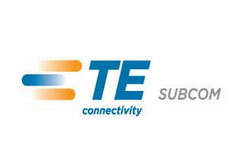 Support for Voice-over-LTE is expected by the end of the year. 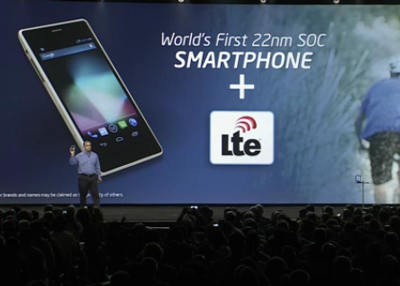 The company's next-generation LTE product, the Intel XMM 7260 modem, is expected to ship in 2014. It will deliver LTE-Advanced features, such as carrier aggregation, timed with future advanced 4G network deployments. "Bay Trail," Intel's first 22nm system-on-a-chip (SoC) for mobile devices. will be introduced this week. "Bay Trail" is based on the company's new low-power, high-performance Silvermont microarchitecture, which will power a range of Android and Windows designs, most notably tablets and 2 in 1 devices. A new Intel Quark processor family is being introduced targeting segments from the industrial Internet-of-Things to wearable computing. It is designed for applications where lower power and size take priority over higher performance. 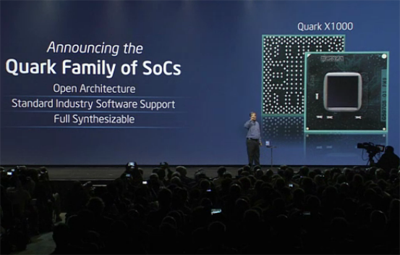 The first form-factor reference boards will sample in Q4. Intel demonstrated a smartphone platform featuring both the Intel XMM 7160 LTE solution and Intel's next-generation Intel Atom SoC for 2014 smartphones and tablets codenamed "Merrifield." Based on the Silvermont microarchitecture, "Merrifield" will deliver increased performance, power-efficiency and battery life over Intel's current-generation offering. A video of the keynote is online. 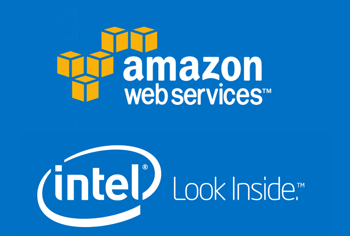 Amazon Web Services (AWS) and Intel announced a technology and marketing collaboration that includes for the first time the use of the "Intel Inside brand for AWS. This lets AWS customers know that the services it provides are utilizing Intel technologies. AWS instances that exclusively use Intel Xeon processors – intended for basic to performance-intensive use cases – now display the brand. AWS is also adding the latest Xeon processor family to its data centers with services available for customers later this year. Amazon Web Services is the first cloud provider to use the Intel Inside brand. NTT DOCOMO will begin offering the new Apple iPhone 5s and iPhone 5c beginning on Friday, September 20. This is the first time NTT DOCOMO has sold the iPhone. 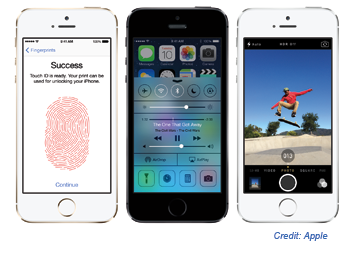 The iPhone 5s supports up to 13 LTE wireless bands, with download speeds up to 100 Mbps. IBM introduced its NeXtScale computing platform for super computing performance in large data centers. NeXtScale can integrated three times as many x86 cores as current one-unit rack servers and is based on open architecture that will support options for compute, storage, and graphics processing acceleration. It incorporates up to 84 x86-based systems and 2,016 processing cores in a standard EIA 19-inch rack. NeXtScale uses industry-standard components including I/O cards and top-of-rack networking switches for flexibility of choice and ease of adoption. IBM also provides a software stack to run on top of NeXtScale, including IBM General Parallel File System, GPFS Storage Server, xCAT, and Platform Computing, providing powerful scheduling, management and optimization tools. 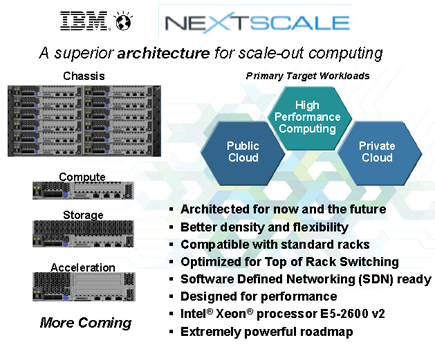 "NeXtScale is designed to deliver raw throughput and performance, and is positioned well to handle HPC, cloud, grid, and managed hosted workloads," said Kevin Rozynek, NASA Client Executive at IBM Business Partner Direct Systems Support. "In addition, this new system provides clients a great deal of flexibility in configuration and components, making it one platform that can do it all." In addition, IBM today introduced the x3650 M4 HD, an enhancement of its 3650-class system featuring first-in-class 12-gigabyte RAID and a 60-percent higher spindle count for higher density storage and higher IO performance, making it ideal for applications such as big data and business-critical workloads. IBM NeXtScale and System x3650 M4 HD are two new entries headlining a broad refresh of the entire System x core server portfolio of two-socket systems including System x racks and towers, Flex System, iDataPlex, and BladeCenter offerings. 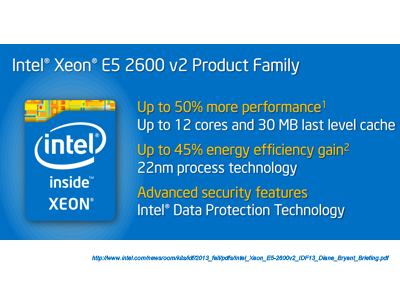 All of these offerings will feature the new Intel Xeon processor E5-2600 v2 product family. Spirent Communications introduced its Avalanche NEXT solution for testing the performance, scalability and security of application-aware network infrastructures. Spirent's Avalanche NEXT can generate authentic traffic and attacks over multiple 10G ports using actual application patterns to test the performance and scalability of network infrastructure prior to live rollouts. The solution, which combines Spirent Avalanche’s performance testing with Spirent Studio’s threats and application emulation capabilities, can be used to test, validate and roll-out application-aware systems and networks. Over 3,500 user scenarios and over 750 protocols that let engineers quickly test with the latest and greatest applications and attacks, all with unparalleled realism and scalability. Line rate stateful HTTP traffic for multiple 10G ports enables stress testing of high scale security devices to find the limits in tracking connections and performance in the most extreme production scenarios. Over 7 Million connections per second which can recreate seasonal, weekly or special event user spike scenarios to verify how the device or network will react. Integrated protocol fuzzing for finding unknown or Zero Day vulnerabilities before they happen so the impact on security systems can be benchmarked and characterized. In 2012, Spirent Communications acquired Mu Dynamics, which developed network security and application performance testing tools, for $40.0 million in cash. Mu Studio, the company's flag ship product line, was designed for performance and security testing of cloud infrastructure, including network security systems, deep packet inspection (DPI) solutions, and LTE networks. 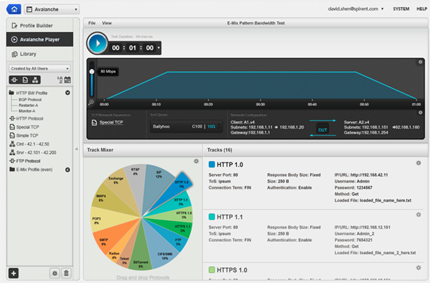 Its Blitz is a self-service load and performance testing solution for cloud applications. Mu TestCloud compiles thousands of ready-to-runs tests, covering hundreds of applications. Mu Dynamics was based in Sunnyvale, California. Farice, which provides fiber capacity from Iceland to mainland Europe, has deployed Ciena’s 100G coherent optical transport technology to upgrade its submarine cable system that connects Iceland and Scotland. Farice selected Ciena’s 6500 Packet-Optical Platform, powered by 100G WaveLogic 3 Coherent Optical Processors, and GeoMesh optical bypass for deployment on its 1,200 km submarine cable system, FARICE-1, and almost 800 km of terrestrial backhaul network where Ciena is the alien wavelength. 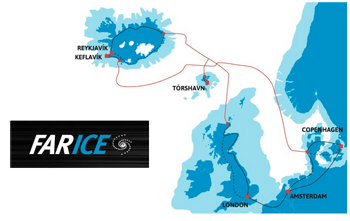 This will provide high-bandwidth connectivity between Reykjavik and Keflavik, Iceland to Dunnet Bay, Scotland. It will also enable Farice to provide high-speed, reliable and flexible on-demand service delivery. Ciena’s GeoMesh solution incorporates an all-optical network design to connect submarine and terrestrial segments into a single seamless link, with high-capacity optical signals carried as foreign wavelengths over the existing terrestrial backhaul network, reducing capital and operational expenses – savings that allow Farice to offer its customers higher capacity at more competitive prices. By allowing Farice to use the same technologies over land and undersea, it can efficiently interconnect its points of presence and service switching centers, with end-to-end service provisioning to make the global network operate as a single, unified network. Additionally, GeoMesh’s simplified all-optical design delivers lower power consumption, therefore supporting Iceland’s green data center goals, while also supporting lower latency to improve connectivity between Iceland’s data centers and the rest of the world. 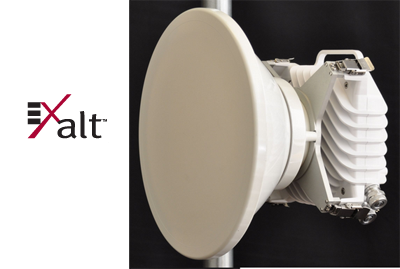 Exalt Communications introduced the 2nd generation of its ExtendAir family of microwave backhaul systems for both short-haul and medium-range links by mobile network operators, WISPs, and enterprises worldwide. The ExtendAir G2 microwave radios operate in frequency bands from 6 to 42 GHz, while the use of field-replaceable diplexers significantly reduces sparing and deployment costs. The ExtendAir G2 systems can scale up to 370 Mbps full duplex and feature errorless adaptive modulation. 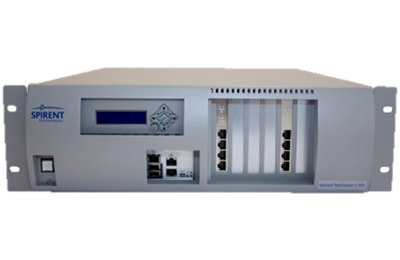 The system integrates a GigE switch supporting QoS, VLAN, and Ethernet jumbo frames. Exalt provides remote management as well as high security with FIPS-compliant 128-bit and 256-bit AES encryption. The units are designed for easy tower or rooftop installation using 802.3at standard PoE. Pricing starts at under US$6,000 per link. AT&T completed its previously announced acquisition of wireless spectrum in the lower 700 MHz band B block from Verizon Wireless. 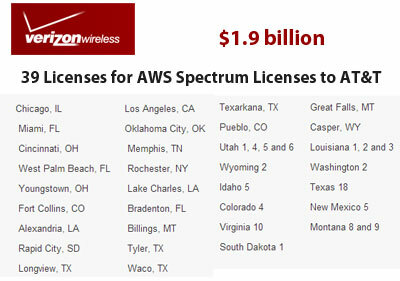 Under the deal, which was first announced in January, AT&T paid $1.9 billion in cash and transferred Advanced Wireless Services (AWS) spectrum licenses in Phoenix, Ariz.; Los Angeles and Fresno, Calif.; Albuquerque, N.M.; and Portland, Ore. The acquired licenses cover 42 million people in 18 states — California, Colorado, Florida, Idaho, Illinois, Louisiana, Montana, New Mexico, New York, Ohio, Oklahoma, South Dakota, Tennessee, Texas, Utah, Virginia, Washington and Wyoming. AT&T’s 4G LTE network currently covers more than 225 million people, with plans to reach nearly 270 million people by the end of 2013, and to substantially complete the build by summer 2014. AT&T’s plans to deploy 4G LTE include the areas covered by this spectrum. 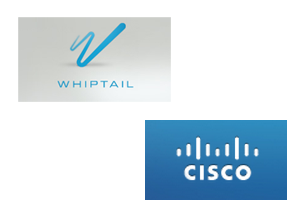 Cisco agreed to acquire WHIPTAIL, a privately-held developer of high performance, scalable solid state memory systems, for approximately $415 million in cash and retention-based incentives. WHIPTAIL, which is based in Whippany, N.J., offers solid state memory systems for accelerating applications such as virtual desktops and data analytics. Cisco said the acquisition will strengthen ints Unified Computing System (UCS) strategy. With the acquisition of WHIPTAIL Cisco is evolving the UCS architecture by integrating data acceleration capability into the compute layer. WHIPTAIL was founded in 2009. TE SubCom and SubPartners Pty Ltd were awarded a contract to build the APX-West submarine cable system linking Perth, Australia to Singapore. APX-West will be a four fibre-pair system using the latest state of the art ultra-long haul design delivering much needed capability and resiliency to the region. It will connect Perth, Australia to Changi North, Singapore with planned branches to Jakarta, Indonesia and Christmas Island. The system is approximately 4,700km long and has an initial design capacity of up to 32Tbp/s. It is expected to be Ready for Service (RFS) by Q2 2015.